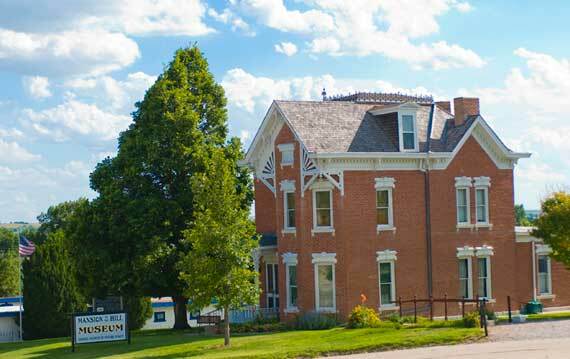 An authentic Victorian style home, the Mansion on the Hill was Ogallala’s finest residence when it was completed in 1887. Today, it is listed in the National Register of Historic Places, and is a favorite with visitors to Ogallala. The Mansion was built by L.A. Brandhoefer, and was made of red brick kilned at the local brick factory. The home was first occupied for any length of time by the H.L. McWilliams family. Mr. McWilliams was a local banker, and his wife enjoyed entertaining from the beautiful home. Located at the corner of West 10th and Spruce Street, the mansion has many unique features, including ten foot ceilings, sixteen inch thick solid brick walls, walnut shuttered windows, and solid brass hardware throughout. Other attractions include two beautifully hand carved cherry wood fireplaces, carved corner blocks and panel inserts on doors and window frames, and ornate curved staircase leading to the second floor. Visitors may tour the authentic one room school house on the Mansion grounds. Built in 1902, the District #7 school house was originally located 5 miles south of Roscoe. The O’Brien/Lute home, an early 1900s homestead era dwelling, is also available for viewing. Owned by the Keith County Historical Society, the Mansion, school house, and O’Brien/Lute home have been preserved and maintained as historical landmarks and visitor attractions. The Mansion is open from the Friday before Memorial Day through the Sunday before Labor Day, Tuesday through Saturday 9:00-4:00, Sundays 11:00-4:00, and closed Mondays.